Would you enter a lottery where Bill Clinton is first prize? Bill Clinton wants to help his wife pay off her campaign debt. So much so that the former president is raffling himself off in an e-mail to millions of Hillary Clinton supporters. "How would you like the chance to come up to New York and spend a day with me? Hillary's campaign still has a few vestiges of debt that I know she would like to see paid in full. Will you reach out today to help Hillary this one last time?" This is the second time in the last few months that Bill Clinton has raffled his time to help his wife. As Secretary of State, Hillary Clinton is not allowed to raise money herself to pay off her campaign debt. The target audience here is not the typical big-time Democratic donors... Hillary relied on them during the campaign and most have already given the maximum allowed. Rather, Clinton is appealing to smaller donors - you can give as little as $5 online and you've bought a chance to spend the day with President Clinton. Hillary Clinton still owes a small boatload of money from her failed presidential bid... records show her campaign is close to $770,000 in debt. Much of it is owed to Mark Penn, Clinton's chief political strategist and pollster. This doesn't include the $13 million personal loan that Hillary Clinton made to her campaign. She'll likely never see that money again. Here’s my question to you: Would you enter a lottery where Bill Clinton is first prize? I'm a Democrat, but deride the idea that Pres. Clinton is our high water mark as a party. Still, the man has a world of experience and anecdotes, and I'm certain that he would be good company. I would rather have a good-natured argument with someone I respect, but disagree with, than trade platitudes with an ideological clone. Sign me up. These kinds of raffles were everywhere back in 2008 as a way to raise cash for campaigns: dinner with the Clintons, beers with the Obamas, Metamucil with the McCains. You name it, they offered it. Sure. I'd love to spend a day with the guy largely responsible for near-record low unemployment rates, a national surplus, and low crime rates. Ahhhhh, remember those days? $5 for a chance to have Bill be my wingman? Where's my wallet? Jack, I'm perplexed and a little embarrassed for him at the same time. Personally it almost seems like he's prostituting himself to pay off her debts. I guess I just expected a little more professionalism and class from a former president. If I had that kind of discretionary (pun intended) funds, I'd enter. However, I wouldn't visit him in New York. I'd rather have him come to my house. I have trees that need pruning, weeding to be done and perhaps a little painting. Yes, Jack, I would love to win an evening with Bill Clinton. I rarely get a chance to wear my blue dress. Five dollars and a dream can get you a day with the former leader of the Free World. Only in America! This is a great idea. Where can I buy a raffle ticket? Sure, on condition that I could ask him about anything and he would answer honestly. I absolutely would enter a lottery in which Bill Clinton is the prize. I think he is a great man! It would be very interesting to spend the day with him. In fact, if he could have served a third term as President I would have voted a third time for him. I also voted for his wife as well. I'm sorry she didn't win but Obama did. Therefore, we still have a Democat as President and that's a very good thing! yes in a heart beat, For Hillary to pay off all of her bills, why not. This is laughable coming from a man who's income is in the top 10% of the country. And, he's the one asking for donations. This is a great example of what is wrong with American politics. Instead of electing people who have the best interest of our country at heart, we vote for the person who spends the most on their campaign. How many other Americans out there are about to crumble under massive debt, that can't get their spouse to auction themselves off for money? It is sad to me that so many people are out of work and Hillary Clinton (who gave her own campaign $13 mil) is asking for these people to help pay her debt. Give me a break! You spend it, you pay it! I met Bill CLinton years ago when he was still governor of Arkansas. I immediately felt the need to wash my hands, So no, I wouldn't waste the money on a chance to spend a day with him. I might be willing to pay for a Bill and Hillary blocker for my TV, however. You bet I would! Spending a day with a former President that has done so much good for the world would be amazing. I really believe he should have gotten the Nobel Prize for Peace. Count me in. I want to meet Bill Clinton. would feel honored to do. Yes! Bottom line, he was one of the best Presidents in the latter half of the 20th Century, from foreign and domestic policy standpoints, and left us with a surplus that was subsequently squandered by Bush and the Republican controlled Congress in the first 6 years of this Century. Everyone wants to blame Obama for the deficit, but the fact is that it was created before the Democrats took control of the Legislative branch in '07 and the Executive branch in '09. There is a part of me that would be very interested in being able to talk to him about various political topics. However, I just don't know if I would be willing to pay for a change in a lottery for that opportunity. YES! One of the BEST President's that this country has ever had, a humanitarian with the insight into helping countries with AIDS and debt! I think anyone in the right mind would jump at the chance! I bet he would have a lot to say about the current state of affairs! Absolutely, no matter what your political affiliation – I would think it both quite an honor as well as quite an interesting day of intellectually gratifying conversation. A lottery is a gamble. Gambling is a fast way to loose. Bill Clinton as a prize to me is a double loss! No thanks. I have been thinking about entering this raffle; although, I probably will not, as I now am on unemployment and every dollar makes a difference with survival. I truly believe if you are a person with any reasonable amount of extra money to spend, then it is a wonderful opportunity to gain insight and perhaps even influence someone with direct connections to the decisions makers of the world. Mr. Clinton is extremely intelligent, and to engage in conversation alone with this man is worth an experience of a lifetime. I just wish I could win this raffle, but logic tells me I need to pay my bills first. Sad, but true. I would absolutely spend $5 for the chance to spend the day with any US President, past, present, or future. Clinton is certainly one of the more interesting living Presidents so why not? How about $50 for a chance to meet with all the living Presidents for an hour apiece? It would be an honor for one thing but it would be incredible to get their opinions on current issues one after another or even better, all together. How are the Clintons so filthy rich? I am just trying to figure it out. They operate a law firm. Explain to me how Hillary can afford to lose $13,000,000? My Dad is a lawyer and he isn't throwing around money like this. Something is crooked with the politics at high levels in this country. I have great respect for President Clinton and Madam Hillary Clinton, but I think it to cheap to ask people to pay the money for lost cause, I think President Brack Obama's campaign should pay these loans and debts. I would be too please to contribute small check. Truly can not afford it! I would!........ BEG and PLEAD for him to come back!!!!!!! No, life is depressing enough. Of course, one of the best presidents in history! I wouldn't paid 10 cents for a lottery that has Bill Clinton as first prize. I know the money raise is going toward his wife debts but why don't Bill Clinton just paid the debt himself? We all know he got the money. Didn't know President Clinton was doing this; but yes, I would donate $5. I was and am a strong Hillary supporter and a Hillary delegate in my local precinct. I am not able to contribute a large amount, but $5, yes – I'd be happy to. I don't believe I'd win the time slot with President Clinton – so that's okay – I love Hillary. Could Mr. Clinton make the ticket free for us unemployed folks?. He does not have to spend a day with me if I win. Just waive from a distance. Bill a democrat, does have a sense of humour so I don't think he is offended by this. I actually would enter a raffle to spend time with him. I'm not a democrat nor am I a fan of his Presidency, but how many times do you get the opportunity to sit with a former President and pick his brain? I'm fully capable of a civil discussion with someone I disagree with so this would be a tremendous opportunity. And for what? A minimum of $5 and a plane ticket? Count me in! Amazing arrogance. No, I would not care to win Bill as a prize. I will use a quote from a movie to tell just how thrilled I would be about spending the day with Former President Clinton.
" I would rather mainline drano than listen to another minute of his incessant prattle." I mean after all, heaven forbid SHE actually work to pay off her debts. I would, absolutely. It would be amazing to sit down and have a conversation with Mr. Clinton. Pretty much any president, really, short of GW Bush. Why not? The man was leader of the most powerful country in the world! You may not be a fan of his, but it's an opportunity not many people get. Yes definitely, I would consider it privilege to spend a day with man of such stature and intelligence. He is one of the greatest presidents in the recent history despite few short comings. Sure, he is an interesting and intellctual person with much to teach and to offer. It would be great to spend time talking to him. I love Bill Clinton to death and I supported Hillary's campaign for presidency. But really Bill? Campaign financing and issues of budgeting should have been better reviewed when the race was still being ran. No, I would not enter a lottery where Bill is first prize. of course I would because we can always help others and learn from others and who knows they also benefit from helping and learning from others! Are you kidding. Mr. Clinton remains one of the most influential people in the world. Though his legacy is clouded by his sometimes dubious behavior, he remains one of the great presidents of the last 100 years. It would be an honor and privilege. Yes, I'd love to spend the day with our own national treasure....Mr. Bill Clinton. Where do I sign up and pay? He was a great President and he still does a lot for our country. Absolutley Jack I sure would! I love and adore the Clintons so much and if I had $778,000 I would pay of Secretary Clinton's debt in a minute, her and Bill are the greatest President and First Lady ever to grace Washington D.C.! It would be a dream to meet former President Clinton and Secretary Hillary Clinton, I supported Bill Clinton when he ran for President both times and won and I supported Hillary when she ran for President as well! I could probably offord to give $50.00 to the cause right about now and again President Clinton and Hillary if I were to meet you both I could die happy, The Clintons are my idols and Im so glad Hillary is our Secretary Of State! Run for President again Hillary in 2012! Cindy from Boston and I would love to spend a day with such a great guy! Who wouldn't want to spend a day with the former President. He is one of our greatest Presidents ever. He is very knowlegable, intelligent and a very interesting person He has a big heart and loves helping people and risks his own health to give them a better life. His charties have raised an enormous amount of money for those who can't afford medicine, who lost everything in some type of disaster or another. He has a lot to say and we should take the time to relish in his contribution to the world, to politics, to the underprivileded and in the process if spending a day with him by entering a lottery helps his wife to wipe out her our debt, so be it, not only will she benefit from but one lucky person will have a once in a lifetime opportunity to spend with a former, well-liked and admired President. Of course I would enter a lottery to spend a day with Mr. Clinton. I would love to ask many questions regarding what it is like to be a president, what a typical day was like, what were his best and worst days regarding being head of state; not his personal life. I'd like to know what it is like now to have his wife as Secretary of State. I'd like for him to ask me questions also, like what people think of his legacy, policy decisions, etc. I think it would be an incredible opportunity for anyone who can set party lines aside and actually learn something about the office and about the man who was elected to it. In a heartbeat, and did. Bill is an American Super Star, a hero. Actually, I like this idea of our former President, Mr. Bill Clinton, to raffle himself off to the general public, in a very positive effort to help Mrs. Hillary rebound financially. It is always wonderful to see a very high profile couple support each other in a rather interesting way. Are you kidding??? I'd pay *not* to have to be around this guy. I would do it in a minute. Bill Clinton is a fascinating, unbelieveably smart person and to be able to discuss the topics of the day with him one on one would be an amazing oppportunity no matter which side of the aisle you are on. For $5 bucks–game on. The quesiton is–who is paying for the airfare to NYC? I would absolutely donate $5 for a chance to spend the day with Bill Clinton. The man was President of the United States and it would be an awesome opportunity. Heck yeah! I think it would be pretty interesting to chew the fat for a day with one of the finest political minds of his generation. I guess I'd be leaving my daughter home, though. day. Well worth the five bucks, Jack ! At last check, Bill & Hillary were adults. They know what they can, and cannot afford... or maybe not. What do you think middle-America would do with an opportunity to get out of debt this easy?? ABSOLUTELY! Who would turn down such an opportunity? I received the email, and am in the running! Mr. Clinton's charisma is legendary in my books and to spend time with him would be a distinct honor! Like you have to ask that question, to get to pick the brain of possibly the most Interesting president, let alone personality, of the last hundred years, count me in. Yes, I would love to enter that lottery! Mr. Clinton is changing the world through his Foundation and I would love to listen, learn and grow from those experiences and accomplishments. I volunteer in my community and can always learn a new way to do anything better for a greater outcome. Where do we mail a check?! Yes, I would enter only if it was an all-expense paid trip. Jack, it would be a hoot to hang with Bill for a day. I remember that his house guests while in the White House also got to sleep over in the posh spare bedroom. Can I assume that will also be included? A full day may be a little to long, the president has a tendency to run on a bit. However, a quick round of golf and a drink sounds worth the 5 bucks. Personally, I wouldn't enter a drawing if Bill Clinton was the LAST prize, let alone the first prize! Of course, with raises in the taxes coming, the poor economy, rising unemployment, and the Democrats spending every last dime they can to turn this country into the largest government supported nation on the planet, *who* does have the money? Tell ya what, Jack, Hillary put $13 million towards her campaign. How much did the others spend? I'll enter a $5 raffle if I can get 1/10th of what all the candidates personally contributed to getting elected. Oh wait, I already do, it's called MegaMillions and Powerball. Tell Bill to get real. Whoopee!! A day with a politician. Talk about a dumbing down session! i would definately by that ticket actually several of them. he did a great job as president of this country. Her maybe, I can always find something to do with Hillary. But what I am going to do with Bill Clinton. I most certainly would and just might. He is so bright, intelligent and YES, charming. Think he is a man who truly cares and a day in NYC with Bill would be A TOOT! I never liked her but do have some empathy. The quest for power always has its liabilities. Now she does the dirty work in the State dept which appears to be at a cost to her health. She has aged pretty quick visually. Now how did she ever get that 13 million usd in the first place? Yes. Like his politics or not, he'd be great to hang around with. Bill Clinton is a joke and a clown. Hilary made the decisions while in the white house which is why she doesn't care that he is not loyal. She's not in it for the relationship, but for the power that comes with being his wife. Most definatly not Bill Clinton can make a hundred million in one year giving speaches he can pay his wife's campaign debt. I just did. Thanks for telling me. No matter what one may think of the guy, a day with him would be very interesting. Cafferty you are tooooooooooooooooooooooo funny! Why not Jack? He is by far the best president we have in last 25 years. I like the fact that he is tryting to help his wife Hillary. Heck Yah!!! He's My HERO!!! I would absolutely enter a lottery to meet BIll Clinton. This is the smartest man I know. No ! Bill and Hillary have all kinds of money, time for them to reach into that old sock. no.there are enough bad things that can happen to us,without paying for a day with an adulter. How about $10 for both Mr and Mrs Clinton? it would be an honor to meet the president bill clinton as he is priceless. if i can be informed as to how to make that donation ONLY because of the president i would. I'd love to, Jack, but only if you were there too. Yea, as much as I don't care for him I would find him interesting to listen and talk to. I would absolutely donate to Hillary to spend the day with President Clinton. Can I borrow $5?? 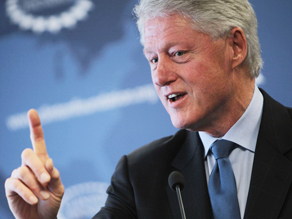 Absolutely – BIll Clinton is a brilliant man and has a perspective on events that is both pragmatic and visionary. It would be well worth entering this lottery for the chance to spend some time disucssing current issues. I sure would like to spend a day with Bill Clinton. You can thank your question for getting me to enter the raffle. We could all learn a lot if we were lucky enough to spend a day with Bill Clinton. If you or George W. were the prize Hillary would be in debt forever! I would enter lottery to spend time with Bill Clinton. I would love to talk with him about various aspects of his presidency. I would have liked to see his wife as President. I think that she has show the skills necessary in her current role as Secretary of State. Yeah why not. There are a lot of things it would be nice to talk to him about, and if you're a democrat the worst case scenario is your helping a democratic candidate pay of some bills. Yes Jack I would very much like to spend a day with this man. After all he is an ex-president with a tremendous history, but more importantly he was a lightning rod for the right wing and because he was impeached is unique. His presidency changed the history of the world. No joke, but who would not want to spend a day with one of our best Presidents? I would be thrilled to. Both he a HIllary have given our country so many gifts. I will probably be one of those lottery entries. It is a win win situation. I will feel good about contributing toward one of the first viable female candidate for President of the Untied States. And no I am not wealthy. I just care. Definitely. Even if you don't agree with the policies, a chance to spend a day with someone of that stature is always a good deal at $5. Yes I would and would love to spend the day with one of our best Presidents yet! Thanks for letting me know, will contribute ASAP. Sure I would enter, given the chance to pick his brain on a variety of subjects would be a once in a lifetime opportunity, personal shortcomings not withstanding...nobody's perfect. Baby, I would buy a whole book of tickets on that one. You bet I would and will! Great President and even an hour would be an amazing experience. Sure would. It is great that he is willing to help Hillary out. I hope he is able to get enough to pay it off. They are a very nice couple and seem to be very excited about Chelsey's wedding. I wish them the best of luck in the future. I agree with Michael – Bill makes a ton of money doing lectures. Dig down deep Bill and help your wife while you can. I would participate if it were a free lottery. I think Bill would make me chuckle. It's a win/win situation. I get to help Secretary Clinton pay down that debt for running the campaign I most believed in and if I win, I get to spend time with the most intelligent, fascinating president we've had in my lifetime. So, yes, I will absolutely enter this. Hell no. He's the last guy I want to see. I don't want to se him for free. Bill should go after the interns , highest bidder(s) gets to spend some time with him. If no bidders, then he can go and do more speeches at $300,000/ speech, if he can find enough suckers, he can pay her debt off real quick. It depends on where he's taking me to eat. Of course In Canada Former President Bill Clinton is respected and admired as one of your best presidents. When former president George Bush came to our city alot of us protested and hollered at this moron. So for sure this would be a great guy to meet oh and we love both of them. Visit us anytime Mr. President and Madam Secretary you are so respected here in Canada. Why should I buy Clinton when I have CSPAN. On CSPAN I can see all the Washington baboons I want. Sure, but money is a little tight right now. Can you spot me 5, Jack? Jack. NO! Not one cent. i wouldnt see him if i was across the street from him. If only Hillary would've bowed out of the campaign gracefully when she knew there was no way she could win – maybe she wouldn't be in this predicament. The gall that Bill and Hillary have to ask for money is repulsive in these troubled times. Forget the campaign rules, let Hillary and Bill dig in their pockets and pay off their own debt. Yes! Yes! Yes! I'd love to had a chance to sit down and talk with one of the greatest minds of our time. Are you kidding? Of course! Absolutely. I met him once – the man lights up a room ;like a Christmas tree! I'd love to spend time with him! absolutely i would, why not? what a great chance to get to meet and greet with a great political mind and maybe get to actually get heard by someone with real power to make changes in this country! Why not, Jack? If I had available funds to spend, I'd enter. However, I would prefer him come to my house rather than me go to NY. I need some trees pruned and some weeds pulled. I wonder if he's any good at painting walls? Yes absolutely, if I had the extra money I would contribute to be able to win a day with President Clinton. Hell YES!!!! I wish Bill could be president again. I love the man! Yes, I certainly would. I have long been an admirer of both Clintons. I even painted a portrait of Bill and Hillary and sent to them. I think they have done so much for this country and was very disappointed that Hillary did not win the Democratic Nomination. I believe she would have been a great President, as he was. I will make a small donation and who knows, maybe I'll be the lucky winner. Having supported Hilary, I would certainly buy a chance to spend some time with Bill. Have you forgotten the state he left the economy in for W? Coincidentally, I had just minutes before completed my donation on line. Hope I win! You have got to be kidding. That is for people with more money than brains. Yeah, but don't think he would answer any of the questions that I would have for him. Absolutely. If I won, I'd put him to work. My lawn needs mowing and we could have a beer afterwards on my deck.....oh, that reminds me; I need him to build a deck, too. Regardless of a person's political views, what a wonderful opportunity to have a chance to spend time speaking with a man who has seen and done so much in our world, both politically and in a humanitarian capacity. If people are willing to shell out $10 to see "Nightmare on Elm Street" I would hope they would be willing to do the same to have a conversation with a well-traveled and well-spoken American icon. That would be wonderful! It would be a great day to meet a former U.S. president, as it is a once in a life time chance for an ordinary American as myself. I don't care what people say, but he is a model for us to follow, on how he is quick to help those who suffer, and comfort them. Abso"freaking"lutely. One of the smartest Presidents and man of my time. You bet. No matter what you think of him or his politics, I would welcome that opportunity. I can tell my family and friends, I actually met a living President, in person and spent the day with him. It would be an honor. Absolutely! I am a 71 year old widow and don't get many dates these days. A chance to spend the day with the most charming and intelligent man in the country and help the woman who is the standard bearer for our generation. That's a twofer bargain I would never pass up. Heck yes! Bill is a rock star. He's one of the most iconic characters of the 20th and 21st centuries. The average "Joe" can indentify with him yet he has a mind for politics that rivals any. Yes I would! Not only was I planning on voting for Hillary, I voted for Bill TWICE! I think he was one of our best president's and I wish he'd run again! Yes! That would be great! What an experience!! I would absolutely pay to spend the day with former President Clinton. Although there were a few blemishes in his presidency, he remains an intelligent and insightful man. Where do I sign up? Of course I would. Who wouldn't want to spent a day with one of the most informed men in the world today. It would be not only informative, inlightening, but also a great honor. I most certainly will enter that lottery. In fact if I were to hit the million dollar lottery ticket, I would pay Hilary's tab myself. Of course. He's brilliant. I've written papers about his leadership style as governor–to have an opportunity to ask my own questions and listen to his answers would be an amazing experience. And I love the idea of helping Hillary. People forget. The Clinton's got run out of Little Rock for being dirty. They collect rent for the guard shack at their home in Chappaqua that the Secret Service utilize, your and my tax money. The just can not get hold of their (legal) frinances. No, I don't fratanize with questionable people. Jack, Im 21 years old and I would definitely not waste my money on something as meaningless as spending the day with the Clintons. I have a lot more things to worry about buying and using my money for, like college. I would love to spend the day with Bill Clinton but as a British citizen can I help reduce Hillary's debt now the campain is over ??. During the primaries I could not contribute to Hillary's campaign as a foreign national. Bill Clinton is one of most interesting, experienced, well informed and articulate people on the planet. It would be tough holding up my end of the conversation with the man but on the other hand I doubt I'd have to worry much about that. I won the lottery back in 1992 to meet President Clinton the day after the ignaugeration, so why not again,,,,,what's the web site? Are you kidding? A chance to spend a day with a former US President. Anyone with any appreciation for history would have to want to win this prize. It's not a matter of weather I like the man or not. It is about the opportunity to discuss history and to understand this man's insight. Yes I would want to win this prize, even if the prize was Nixon. In a heartbeat..............are you kidding! I'd be so nervous, I wouldn't know what to say! I received this email from President Clinton and would absolutely enter, if I had the money right now. His is one of the greatest minds of our time. I would love the chance to converse with him, one on one. I also think that he is a great humanitarian, and would be honored to meet him on that basis, alone. powerful government position like an ordinary citizen must do. Sure would I think its a great idea! I think Bill Clinton was the best president this country has had in the last 50 years and would love to spend some time with him to help Hillary out. So tragic I can't have the same endoresement for Mr. George Bush and his gang. Jack, Yes I would, I am 50 years old and Bill Clinton was the best President I have seen in my lifetime bar none. So what he had an affair. That has absolutely nothing to do with the job he done, nothing. I would put his record up against anyone that has held that office in the last 50 years hands down. The last guy was an idiot. Jack I'd also be willing to bet he wasn't the first President to cheat while in office and won't be the last. Definitely! A chance to be acquainted with such a profoundly great man and share thoughts on today's momentous issuses would be so awesome! Furthermore, helping finance Mrs. Clinton helps the USA: a true leader and perfect compliment to her husband. Absolutly, any chance to have personal contact with a president or past president would be a wonderful experience for anyone. I give him a thumbs up for the idea. What the hell, I lived with Barack Obama for a year on the Upper West Side Street. If I can live with him for that long, I suppose I can stand one day with Bill Clinton. But no longer, please. I would like that . I would also like to see him on Mt. Rushmore. He had Amercans working and Reagan fired Americans. Jack, great pitch for the Clinton lottery – but you left off the website address – please post it in your segment! I worked behind the scenes on the Hillary campaign as part of Democrats Abroad....maybe it hasn't been on my radar screen; I didn't know she still needed financial help. Count me in – I will give what I can. Day with Bill Clinton – wherever???? I would "love" ( !!!) to discuss his social issues with him for a day – or more, and a few of my favourite issues, as well. This is such a creative idea. Offering any strategies to "win"????? Spending the day with Bill Clinton would be a wish to come true. He is a very interesting person, and one I have always admired. If only I could be so lucky!!!!!! You betcha!!! Just love that brilliant man. In a word, . . . no, Jack. . . . A big no, Jack. Yes it is me again. I would tell Bill he would better off divicorcing his wife or at the very least helping us lowly Georigians in business.to do what he can. He is all over Haita, which is great, so how about getting all ove the USA. I don't get it. Frankly I think all of these guys, including Clinton, or phoneys, and the good news is that most of us have finally figured this out. What are we going to do, Jack? America For Sale. Clintons For Sale. President For Sale. Its the new world, isn't it? Not me. Sorry. This just turns my stomach. Bill Clinton is a Hero!! Full of brilliance and charisma. He remains the Best President in our history books. And to meet him would be an honor. Depends on what the definition of 'is' is? This is the very first time that I have responded to the Cafferty statements. I have responded to others, but have not seen them on TV. I am very new to this business about ""talking"" to the TV channels. I very much like the Cafferty comments. Within this last year, I believe, he was on CNN with Blitzer, and told about his addition, and how he overcame it. I thought that was very brave of him. As far as my answer to the Bill Clinton question, my answer would be no. For $5 I damn well will and this from a l'il ole widder lady. Absolutely! Best president we've had since WWII! He left a surplus in the budget. We also didn't have to worry about attacking countries that aren't a threat. Yes, I'm talking about Iraq. Bush, Sr. did the right thing..he had Hussein pinned down with no fly zones north and south of him. He couldn't even leave Bagdad! Currently, I would not enter a lottery where any politician (current or "ex") was first prize! The opportunity to spend one day with Bill Clinton, to have him share his memories of meetings with world leaders, having him define what a true leader is, and a chance of experiencing "reality history stories" from a great story teller, would be one of the most incredible days of my life. pay the debt off instead of asking people who do have the money. That's a big HECK YEAH! In a heartbeat, I love the guy! In a HEARTBEAT ! Bill's savvy and intelligent; I'd jump at the chance. She shouldn't expect to have her "Personal Loan" repaid anyway. She lost and it should never have been a loan in the first place. It was an investment she made toward her aspirations. I am so glad Obama won. I know she is trying to set herself up to run again and she really won't be happy until she is President. I hope she never is. Jack, Only so we could have a "discussion" about his signing of NAFTA, his push to strip Wall Street regulations, his insistence on out-sourcing being a great thing for all Americans....., I could go on, but I'm afraid I might do something I'd have to serve some time for, and he's not worth it. Layne A. Antioch, Il. Absolutely! Would be the thrill of a lifetime! We have been supporters from the beginning . Absolutely...He is brilliant and so is Mrs. Clinton...It would be a dream come true to spend time with either of them...especially, since I'm a rare progressive here in the deep south. Absolutely, It would be an incredible honor, President Clinton is incredibly smart, knowledgeable and I can't imagine having a better or more well informed companion for a day. He is also charming, funny and I have always admired him, regardless of "the scandal", he always had my support. I didn't vote for Hillary, but I will if she runs again. I am definitely going to send in my five dollars and then try to put it out of my mind. It's sort of like winning the lottery, only better, how many chances are you going to get to spend a day with President Clinton? I made my contribution and when I wrote before I forgot to add that I have had the priviledge of meeting both Pres. Clinton and Hillary while working on his campaig for Governor of Arkansas. What amazing people they are. NO! I certainly WOULD NOT enter his LOTTERY! Both him and his wife have MILLIONS – why can't they pay-off her FAILED Presidential bid? He could still RAFFLE himself off – with the money going to the families of the brave soldiers families who have lost their husbands or wives! Also let him work to help them and other very worthy causes on a permanent basis – he obviously hasn't got enough to do!!!!!! It would be a pleasure. Better yet, Bill can raise that amount to $50.00 and my husband and I would still buy the tickets. There are not many people in our generation who have as much clout in the entire world as President Clinton. His wife will go down history as the first woman who was a credible challanging contender for the Presidency. Not everyone is hang up about his past personal indiscretions. That is his personal life for he and his family to deal with. Obviously they have. I am not interested in gossup. I would like to hear his take on a lots of world issues. Few people have his broad insights, knowledge, caring and understanding for this complicated world we live in. Sure would. If he had weekly drawings, I would probably pay $5 every week for the chance. My question would be do they draw the winner randomly or do they make you write why you would like to be chosen and choose the winner. So where's a link to the website that you can enter at? Of course....He was a great President...He was our President! I would NOT give anything to be in the same room as this MORON! I'm writing from Vancouver Canada and wonder if I'm elligible as it would be facinating to to meet this man. And if so how many 5 dollar donations can I make. I entered and hope to win. Ha! Sent the email to two girlfriends to see if they would take the bait. What a sense of humor he has to put himself out there. He is a good economist. Yes YES Jack,would love to.I voted for him both times.He is a smart man.Nobody can beat him talking.Pres Obama is next they no how to talk and explain things.Nothing wrong with Hillary as I saw her in Dallas when she was here with her book.I kiss her on the cheek will never forget it.I love them both. yes, he is a great person.Where do I sign? You have got to be kidding...he should be paying us for the repeal of Glass-Stegall act that contributed to the financial mess we are in right now! Of course, I would by a ticket for $50.00 each to spend time with Mr. Clinton.